In the “Neurophysiophenomenology” project, we combine VR setups with portable brain and body measurements, using EEG/fNIRS and ECG/EDA/EOG, respectively. The aim is to study subjective (affective) phenomena like under more life-like conditions. 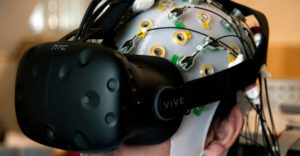 In a recent study (led by Alberto Mariola, Felix Klotzsche, and Simon Hofmann), we associated self-reported emotional arousal during a virtual rollercoaster with EEG-derived “brain arousal” (more specifically, alpha power; cf. poster presented at IEEEVR 2018 and paper at IEEE AI VR 2018). Funded by the Federal Ministry of Education and Research (BMBF) and together with clinical (Tagesklinik “Cognitive Neurology” Leipzig, Charité – Universitätsmedizin Berlin/ Humboldt-Universität zu Berlin), technical (Fraunhofer Heinrich-Hertz Institute), and industry partners (HASOMED GmbH), we recently started the project “VReha – virtual worlds for digital diagnostics and cognitive rehabilitation“. In VReha, we prototypically develop VR-based apps that can be used to assess and train cognitive capacities or help the diagnostics and rehabilitation of cognitive deficits in patients.